Dickinson Center Celebrates 60 Years of Caring — Dickinson Center, Inc.
Elk County Commissioners Janis Kemmer and Matthew Quesenberry, Sr. presented a 60th anniversary proclamation to Dickinson Center’s Executive Director Heidi Thomas, CPA, during their meeting on August 14 in Ridgway. Formed in 1958, as the Ridgway Area Psychiatric Center, the name was changed in 1982 to honor their founder Dr. Robert J. Dickinson, a prominent psychiatrist. Dickinson Center now has locations in Ridgway, St. Marys, Coudersport and Bradford with nearly 200 employees operating in Elk, Cameron, Potter, McKean, Forest, Warren, Jefferson and Clearfield counties. Dr. William Conrad, a member of the Dickinson Center and the Journey Health boards, reflected on his long-term relationship with Dickinson Center’s leaders and Dr. Robert Dickinson. Dr. Conrad described Dr. Dickinson as well-respected and an asset to his profession. Dr. Dickinson could be credited with launching one of the first outpatient behavioral health facilities in Pennsylvania. 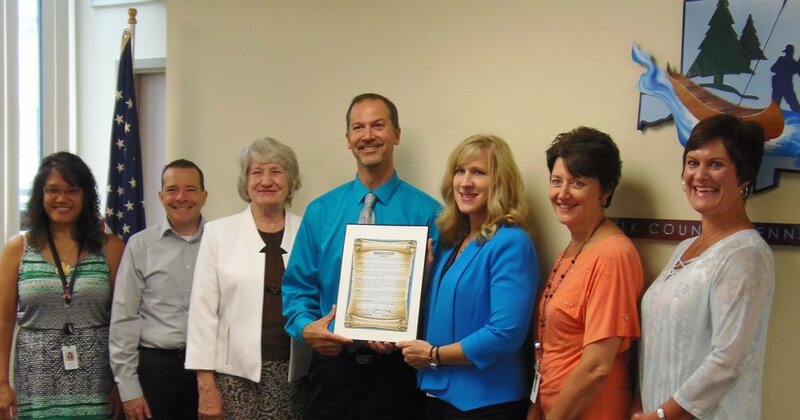 As part of this milestone event, Elk County Commissioners Janis Kemmer and Matthew Quesenberry, Sr. presented a 60th anniversary proclamation to Dickinson Center’s Executive Director Heidi Thomas, CPA, during their meeting on August 14 in Ridgway. Quesenberry provided a brief history of the organization before congratulating and thanking Dickinson’s representatives for 60 years of serving the behavioral health needs of the county and the region. In addition, an employee celebration picnic and staff appreciation week will be held. Dickinson Center is accredited under the Standards for Excellence Program by the Pennsylvania Association of Non-profit Organizations (PANO). The Standards for Excellence is a national initiative established to promote the highest standards of ethics, effectiveness, and accountability in nonprofit governance, management, and operations. Dickinson Center’s Executive Director Heidi Thomas lauded their past CEO John Yates for his leadership and for being instrumental in the growth of the organization during his 39 years at Dickinson Center. In response to the future needs of the community, Dickinson Center will launch a capital campaign to purchase land and build a 10,000-square foot outpatient treatment facility in St. Marys. To make a donation to support this project, please call 814-776-2145.